Isn’t it amazing that there exists data to support or dismiss a business action? Thanks to technology, most business undertakings have become seamless and less daunting. The same applies to sales functions as well. Earlier, businesses used to rely solely on sales outcomes to determine current performance levels and create or modify sales strategies. However, this trial and error approach to making sales decisions is a thing of the past. The introduction of concepts, such as business intelligence, predictive modeling, and prescriptive analytics, have allowed enterprises worldwide to unlock the seemingly God-like powers that exist within data. Advanced analytics solutions have allowed for access to a wide array of metrics that shed light not only on future business outcomes but also how the said outcomes can be altered before they occur. This is possible when predictive and prescriptive analytics tools are used in conjunction. Predictive analytics, as the name suggests, tells you what’s likely to happen, and prescriptive analytics makes actionable recommendations that help control or change predicted business outcomes. Now those are indeed God-like powers to have in one’s possession. Moreover, analytics solutions are becoming more scalable, customizable, and easy to use with growing technological innovations. The advent of sales analytics resulted in sales professionals paying attention to metrics such as dials and e-mails per day to track prospects. As for performance measurement, pipeline value and win rate were the metrics that were considered. This was the period when salespeople had just begun to understand the value and potential of data analytics. Then came the phase when enterprises started improving their analytics capabilities with the usage of sales analytics tools. Enterprises began to discover more sales performance metrics, such as quota attainment and lead velocity rate, which had a considerable impact on revenue. Also Read What Is TensorLayer And How Is It Different From TensorFlow’s Other Machine Learning Libraries? Cut to present times, a large number of enterprises worldwide are realizing that building an “analytics first” culture is the key to continual business growth. Leading players in various industry verticals are taking their sales analytics efforts to unprecedented levels, boosting performance and revenue in the process. Now let us discuss exactly how far sales analytics has come. The use of analytics solutions is quite widespread today. Many enterprises worldwide are nurturing a data-driven approach to their business undertakings. This approach is made possible when advanced analytics capabilities are embedded into an organization’s decision-making system to create a digital decision engine. With technology vendors and analytics service providers aplenty, most enterprises can afford the luxury of establishing such decision engines and then benefit from the same. Therefore, analytics technology enables enterprises to maximize ROI and drive sustainable business impact. These benefits apply to pretty much any business function you can think of, be it sales, marketing, or supply chain. Now let us take a closer look at how sales analytics solutions are giving enterprises complete visibility and control over their sales processes. Sales managers can use analytics solutions to track sales performance both at team and individual levels. Managers can generate reports with details such as overall sales target, gap to target, value left in the funnel, average sales cycle, and win rate. These insights help identify “at-risk” teams or individuals in advance such that appropriate measures can be taken to provide support and improve outcomes. Sales reps, with the help of analytics platforms, can get a broad view of where they stand when it comes to performance. They can identify aspects that are driving their overall performance and understand how they are doing when compared with their peers. The sales rep can also get exact stats for each performance parameter. For example, the rep can see his or her funnel growth percentage versus the peer group’s funnel growth percentage for self-assessment. Thus, these insights also fuel the competitive side of a sales rep. Sales analytics solutions make prescriptive recommendations pertaining to opportunities that are likely to have higher conversion rates. Higher the opportunity score, greater the probability of conversion. Sale reps can, therefore, prioritize their opportunities based on such actionable recommendations. Oftentimes, certain opportunities do not transition from one stage to another at the expected pace. Analytics solutions help in determining these “off pace” opportunities. Such insights help sales reps in taking the most appropriate course of action as per business needs. In conclusion, sales analytics technologies, upon effective deployment, can improve sales performance and effectiveness significantly. However, the key words here are ‘effective deployment’. Enterprises need to institutionalize analytics to make the most of their data and accelerate business impact. Data-driven organizations such as Google and Amazon didn’t master analytics deployment overnight. Optimizing data analytics takes time, investment, and effort; the end result, however, is always sweet – maximized ROI, improved performance, and skyrocketing sales figures. 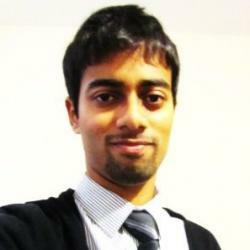 Ramesh Ilangovan works as a consultant at BRIDGEi2i Analytics Solutions. He has experience in diverse areas, including business analytics, automobile, media and entertainment, and research. He has authored several articles and thought papers pertaining to business analytics and technology. His other interests include content marketing, sales strategy, music, and photography.